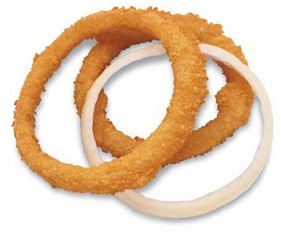 Onion rings are a delicious and crunchy snack that can be eaten in many shapes. The onion rings are, like their name, rings cut from onions, fried in deep oil. You can coat the rings in bread crumbs, beer dough or tempura. You can dip them in ketchup, mayonnaise, tartar sauce and more. The onion rings are a perfect addition to the meal, and the day of the onion rings (which we do not know why it is so determined) is the day to buy or prepare them.